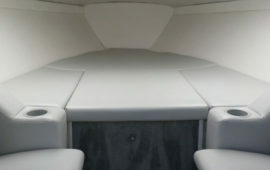 Bluewater Canvas & Upholstery offers you completely custom made cushions for the interior and exterior of your boat. 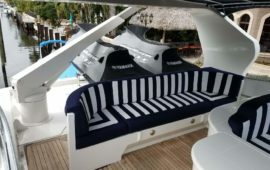 Whether it be with our specialized marine vinyls, or our interior Sunbrella fabrics, we have the capabilities and no job is to complicated for us. We work with many different types of foam depending on your application, and have many different construction formats depending on the location of the cushions. There are many different solutions to attaching the cushions to boats so they stay in place. Whether your cushions need repairs, recovering, foam replacement or if you just need brand new cushions, we are the ones to call! We use top-quality fabrics and foam, Textilene or Phifertex, not to mention the best in marine grade materials and accessories (zippers etc.). If you have a cushion you want us to replicate, bring it in – or even just bring in the cover – our experts will take it from there. We are very proud of the work we do and we take pride in customer satisfaction.